I have never had a serious thought about reviewing products until last week when I got a mail from Gits company asking me to review their product. Usually the ready to eat stuff don't impress me at all, since they are loaded with preservatives and the veggies are not fresh etc. But then I just thought of checking out with their website to know about their product and was pretty surprised to see a striking statement saying - "No Preservatives and shelf stable at room temperature for 12 months!! " WOWWW but how?!! was the question in my mind and I instantly agreed to review their product. 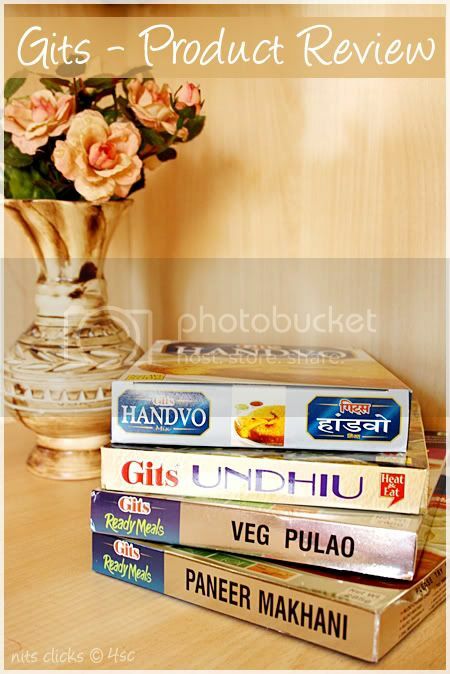 I got a package in a weeks time which included four of their products - Veg pulao, Undhiu, Paneer Makhani and Handvo. I was damn inquisitive to read the cover and know about it as well as taste test it. 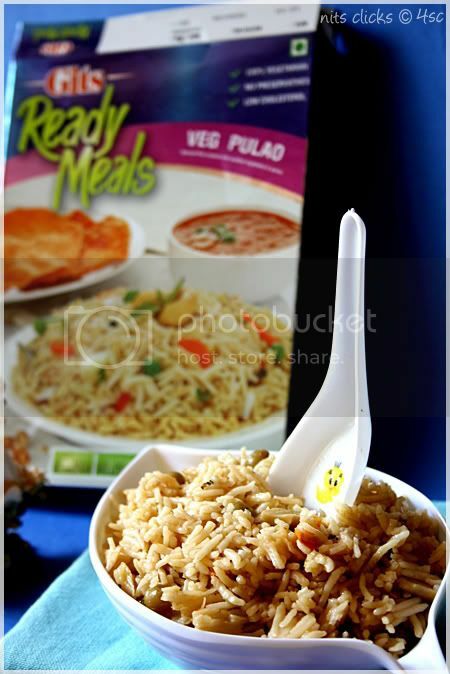 The first product that I tasted was Veg pulao. Its a pretty common dish at my place and we have loved the home made version than the restaurant style. But then I should say Gits veg pulao was really good and my parents agreed to it too. The quality of basmathi rice and the subtle spices were making it appealing to the tongue. There are limited quantity of veggies in it and were well cooked too. I found it a little greasy but the box reads the fat level to 0.05g per 100gms of the food which sounds pretty acceptable. Verdict - Tastes good and for sure a keeper on busy days. 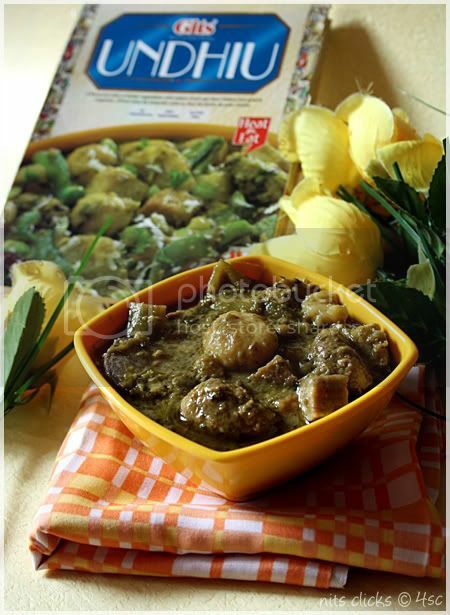 Undhiu is a specialty dish from the western Indian state of Gujarat. This dish is entirely new to me and I wasn't sure how the traditional one tasted. Its basically a combination of winter vegetables combined with baked chickpea flour fritters(koftas), greens and then garnished with freshly grated coconut. Reading the combination made me literally drool. The dish did keep up my expectation and dint fail in any way. The spices were unique and the soft koftas were melting in the mouth kind. It went really well with hot chapathis. The pack had 300gms of Undhiu and this was pretty sufficient for three of us. Verdict - A good one to depend on lazy days. Paneer makhani is our darling delicacy of Punjab. This is my personal favorite out of the four I received. I simply loved it. 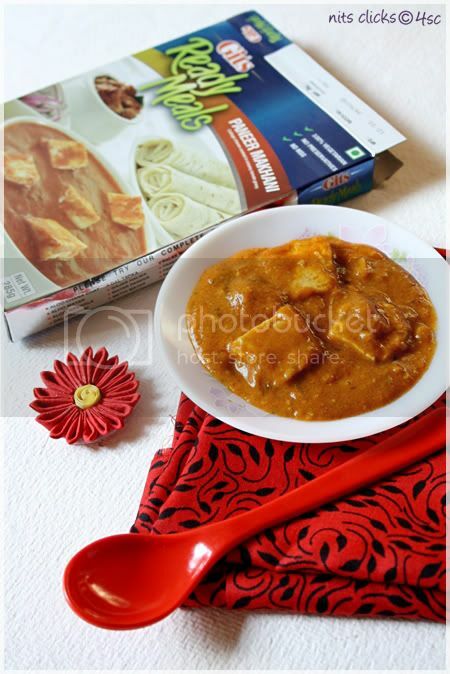 The paneer cubes were so soft and delicate and the rich and creamy gravy made it all the more yummy. The spices again were subtle and perfect for my taste buds. They matched so well with roti for dinner. The pack contains 285 gms and is sufficient for two people. Verdict : Creamy and yummy. 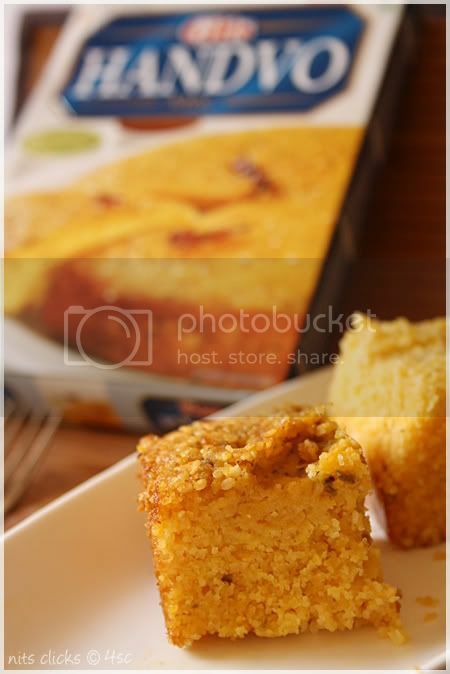 Handvo is a traditional Gujarati savory cake and is suppose to be a difficult one to make I guess. "Guess" is because I have never heard about it before and of course this was the first time I tasted something of this kind. ;) It wasn't hard to make since Gits had done it all simple. In spite of all the troubles taken by Gits, I wasn't able to get the so called "perfect" consistency since I dint have the right equipments to make it. 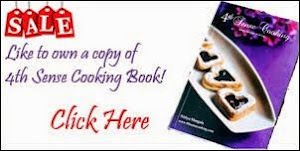 Handvo is generally made in a specially designed Handvo cooker or a heavy bottomed non-stick saucepan. I don't posses both, so tried to bake one portion of it in the oven and steam cooked the other. I found it absolutely yummy both the ways and had no regrets with it except that I wasn't able to make it the traditional way. Verdict: A traditional recipe made simple and handy. They claim that their products are hot filled in laminated multi-layered aluminum foil pouches which are able to withstand thermal processing temperature in excess of 100°C at the specified pressure required for sterilization. And hence they have a shelf life of 12 months in room temperature. The price of the products range from 50-60Rs. Checkout their website for more products and details here. Disclaimer: This is an unpaid and unbiased review. My review depends totally on my taste and choices. I used to make gulm jamun pack from gits.... they always turn out pretty good....:). Good reviews, but I don't like their Handvo mix. It's not real handvo. I like their Medur vada, rasam, ans gulab-jamun. I haven't tried gits so far but from what I gather from u I sure must try one of these. That was a truly helpful review...I have never tried any of the mentioned products..May be I should try them soon..Thanks Nits!! Lovely review, Nithi. I too use them at times and find them pretty good. ihave tried dhokla and jamuns from gits. The Dhokla & jamuns are a fav at home... not tried the new packs. hey! no one asks me to review and eat; though I am sitting here to see if something new comes searching for me. Gits is a sure no-no brand here in Germany! Esp their Dosa mix!! Interesting to see they are doing well in the local arena !! Thanks for the great information! Gifts in Coimbatore This blog helped me to get creative gift ideas..
We are providing export import service of gits products all over world.You can check our it here. Intant Gits product export from india. New Diet Taps into Innovative Concept to Help Dieters Get Rid Of 12-23 Pounds in Only 21 Days!